Market Data – FPGA Now! So what now. We know what a NASDAQ ITCH 4.1 Market Data Message looks like. The format is very simple, there is some – yes – ASCII data in the message format, and all messages are preceded by the message length. Message length preceding the message makes it very easy to interpret a feed from inside an FPGA. What to do first? Well, what does eXtreme Programming say to do? It says keep it simple. 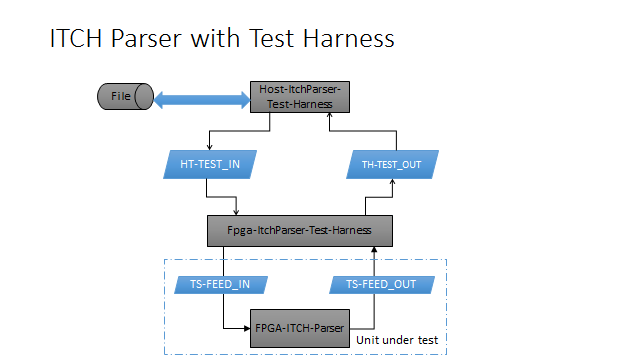 FPGA reads the feed, skips over messages types that it does not know how to handle, and parses only messages of a specific type. Send back to the host computer a statistic – any statistic for now. 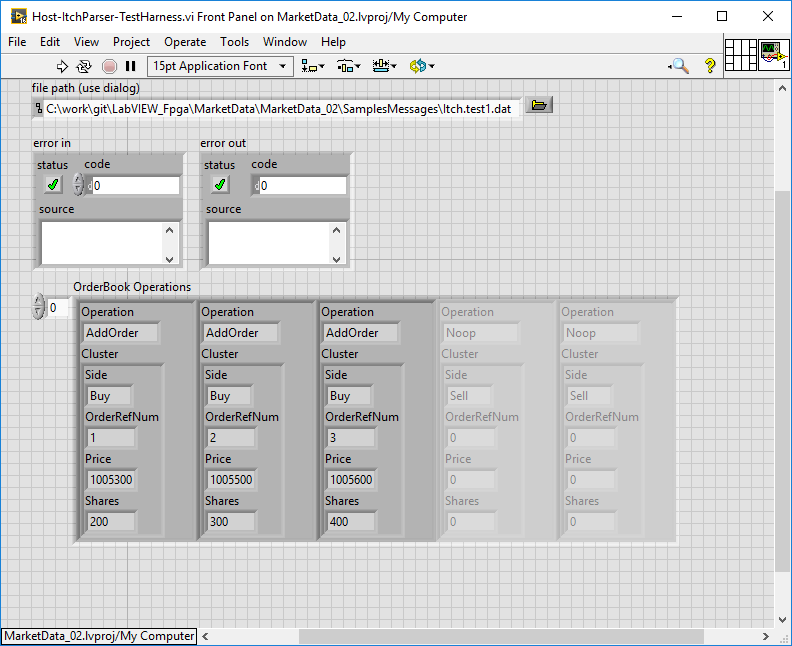 Now I have three files, named: T.itch, T.5.itch, and T.50.itch, and I will write a LabVIEW program to send all data from one of the files above in to the FPGA. Right now I have generated a file that contains, 1, 5, and 50 Timestamp messages. So that means, for each messaged that is encountered, I will extract the timestamp, which will be in seconds, save it in to a local FPGA variable, and send the value back up to the host. The purple colored box is how the FPGA receives the data from the host. 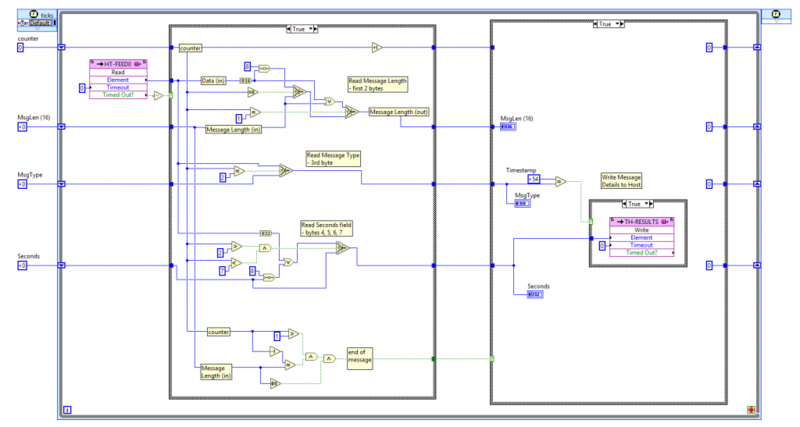 In a live application, the purple colored box, also known as the “Read (FIFO Method)” can have this data come directly from a 10 gigabit connection, or from another loop inside the FPGA. As the data comes in, a counter is started at 0, and depending on the element count, the data is stored in different output variables. The first 2 bytes are the message length, the 3rd is the message type, the 4th, 5th, 6th, and 7th elements are the Seconds portion of the message. 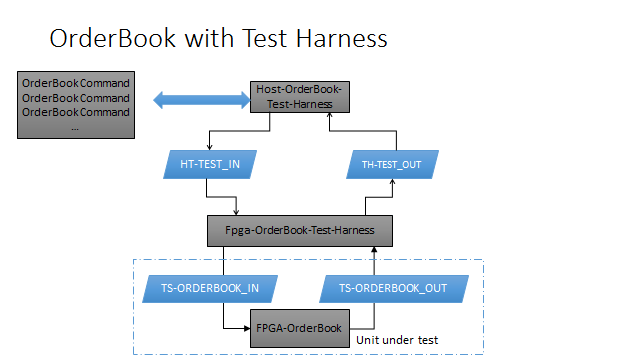 After the end of the message is read, we have a case structure, which is similar to an if statement but for FPGAs, which will read the appropriate variables and send them back up to the host via a DMA-FIFO. 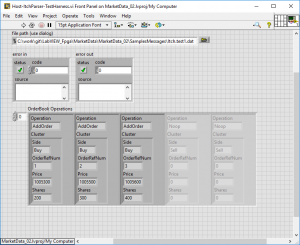 Now this DMA-FIFO can be configured to send data up to the host computer, or to another DMA-FIFO inside the FPGA. For now we are going to send this up to the host for analysis. Take a look at the right-half of the original FPGA vi screenshot. This element executes once, and reads the Seconds variable and sends it up to the host. 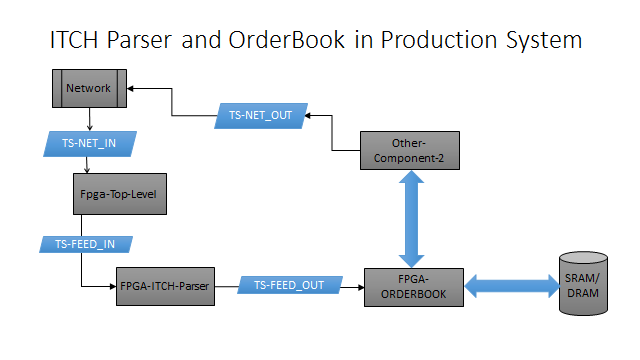 In part 3, I will add another feature – Add Order with MPID, so we can now know in the FPGA when a new order is entered for a particular security, what side that order is on, and how many shares/price. This is more meaningful information that can be used to trade the markets, especially during a Donald Trump speech!